Afer making these agate slice cookies not too long ago, I became a bit obsessed with geodes and agates. I watched countless videos of people making beautiful geode cakes. I even watched people paint agate slices on all sorts of things. 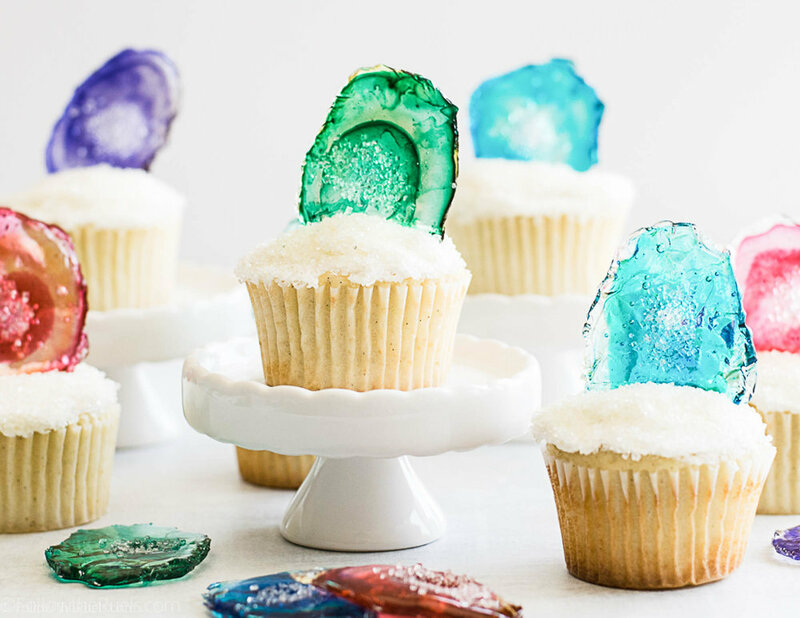 Since geode cakes have sort of been perfected (I mean, come on, this is just ridiculously amazing), I set out on trying to make agate cupcake toppers. These are the things I think about, guys. Not about world peace or solving the debt crisis...how to make a candy agate to put on top of a cupcake. It took several attempts and quite a few burned fingers, but I finally found a method that worked the best. In my first attempt, I tried crushing candies like I have seen other people do online. That worked out okay, but they didn't seem all that realistic. For my second attempt, I used isomalt, which is a fancy form of sugar that a lot of bakers use. Again, it worked okay, but it still wasn't the effect I was looking for. I also ran out of isomalt, so it may have eventually worked for me, but I couldn't keep experimenting. In the end, it was plain old sugar that worked best for me! I boiled water, corn syrup, and sugar until it reached that "hard crack" temperature, then I dyed it a bunch of different colors and layered the colors together. The very first thing I did was to make molds for my agates out of tin foil. I made them all different shapes with rough, uneven edges. 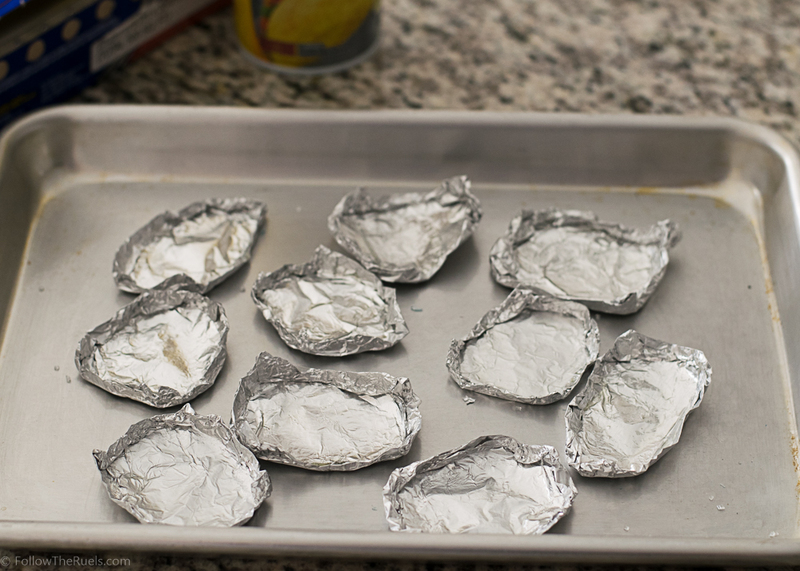 I sprayed each mold down with a bit of baking spray so that the sugar wouldn't stick to the foil. Next, I worked on the sugar. I boiled together the sugar, corn syrup, and water until it reached 300 degrees. Then I poured it into individual silicon muffin cups (which came in super handy!) and tinted each one a different color. Some I made a dark shade, others I made a very light shade. I also left a couple plain. Keep in mind, if you decide to make these yourself, that the sugar does start to cool and harden relatively quickly. Each time I made an agate, I reheated the colors I was working with in the microwave until they were easily pourable. If they are too hard, not only will they not pour very easily but they won't create those concentric rings of color. To make the agate slice, I poured one of the colors into the center of the foil mold. The candy should be hot enough that it starts to fill the surface. Then I poured a darker shade of the color into the center. I followed that with either the clear or light shade of the same color and alternated a couple of times until candy filled the mold. While the candy was still hot, I sprinkled some very coarse clear sanding sugar right into the middle and used a toothpick to press them into the candy. The candy itself cools in just a matter of minutes. 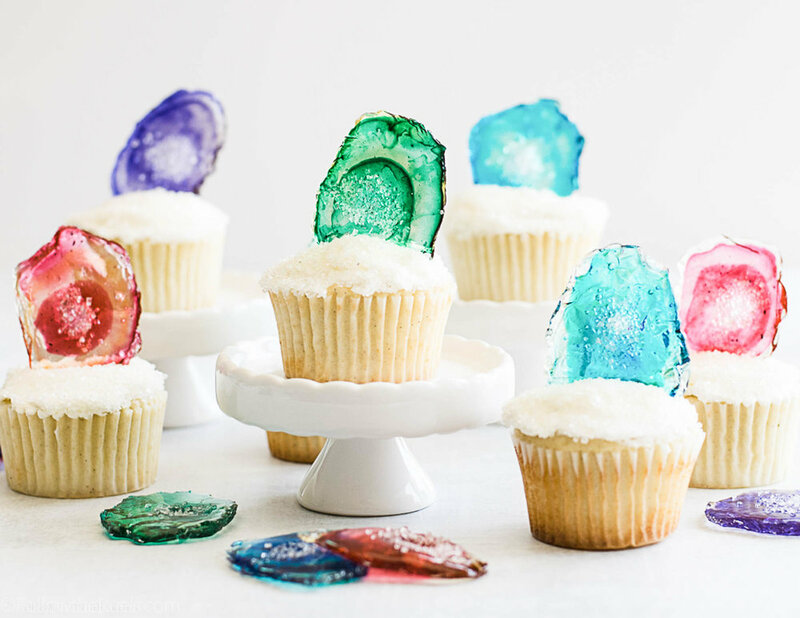 Once they were completely hardened and cool to the touch, I peeled the foil away from the candy to reveal one beautiful agate cupcake topper! For the cupcake itself, I kept it pretty simple. I didn't want to take anything away from the candy agate. I spread on a bit of buttercream frosting, then dunked it into a bowl of the coarse sanding sugar and stuck the agate right on top. Maybe I had lowered my expectations after my previous two failed attempts, but I was actually a bit blown away by how cool they turned out. I love how the colors flow together and the light can shine right through them. While they don't look exactly like agate slices, they definitely look like some sort of really awesome gem or geode. I could definitely see these topping cupcakes for lots of different occasions. I made my favorite vanilla cupcakes with my favorite buttercream frosting for these to keep it simple. But you could make any flavor you like. I think people will be so impressed with the cupcake toppers, they won't even care what kind of cake is underneath! In a stock pot over high heat, bring sugar, corn syrup, and water to a boil. Stir the mixture to make sure that it doesn't burn on the bottom of the pan. Let the mixture continue to boil until it reaches 300 degrees. Remove the pan from the heat and divide the sugar syrup into small heat proof dishes (or silicon muffin molds). Color each one a different color, alternating dark and light shades. Form small molds using tin foil to form the shape of your desired agate slice. Spray each one down with a bit of baking spray. Make sure the sugar mixture is still hot and pourable. If not, place in the microwave and reheat for 30 seconds at a time until it hot enough to pour. Pour one color into the center of the foil mold. Immediately pour another shade (either much darker or lighter than the first) into the center of the first color. Alternate with different shades until you have filled the entire mold. Let cool for at least 10 minutes before removing the candy from the foil. Place on top of the cupcake as desired.